HVH Interiors > Home Decor > How to prep interior of the house and how to paint walls? If you wish to get your house painted, but go no clue where to start from, and then read ahead! For your interior painting prep you need to get organized before you start painting, begin with using the paint chips first in order to know your colors. Use these chips to observe clearly how the colors you have selected appear in day as well as night light, in case you are getting the room them designed you would need to be all the more careful while selecting the color. Also decide on the texture as you think would look just fine at your home, with the colors you have selected. For interior paint prep ready those brushes by rubbing them against the walls and checking which ones need trimming and to what extent. Also get a joint compound and flat spackle knives ready to fill up those holes. Get all your painting materials in place and check if you have all that you would b needing for your painting job. Make sure you are extremely comfortable suing them, before you start with the real deal. Once you are through with your prep for interiors, have a close look at the walls, get the furniture removed off the walls, along with all the curtains, the rods, and screws, etc. (you might as well like to pack them away till you are done with the painting job is complete since you would not be needing them until then. Clean up the walls and remove and traces of cobwebs etc form all the corners, you might like to watch them a bit with water and soap top in order to ka e sure that all the dust and grime is gone. However in case you do so, just make sure that the walls have been thoroughly dried before you begin with the painting. Many a times you would need to rub the walls with sand paper to get the surface smoothened. In case you need to patch up the holes, by filling them up with the joint compounds, sue a sand paper on the walls after you are done with that. Chances are you would almost certainly encounter this situation. Now, it is finally the time to start painting! Cover all your furniture and the floor with drop clothes, since you obviously would not like the paint to touch them. In case you need to paint the trim in upper room paint and dry them first and use a painter’s tape to protect them. As you start painting the room, it is suggested that you go from the ceiling to the bottom to catch any drippings. Paint the walls in long and even strokes to ensure that the paint gets well distributed. Dry the first coat, evaluate its effects and then out on the second coat of paint. 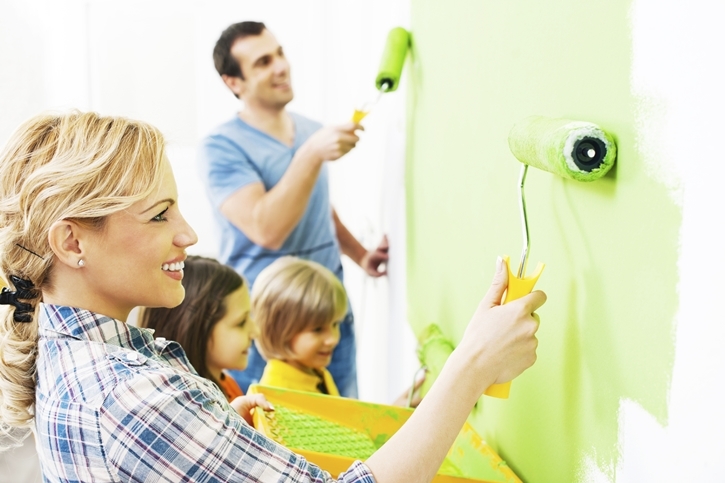 After you are done with the second coat, let it dry and enjoy your room makeover!